La Cana Golf Course, design by the famous course designer P.B. Dye. The home is located out to Hole #7. Indoors and out doors dining areas. There are TV's in all bedrooms and in living room. Two pools, one large and a small. Casa Blanca is a staffed villa, maid service hours from 8am-4pm. I don't tend to comment on my stays but I have to with this one. Everything was first class all around. The location of the house is perfect. Off the tee on the 7th hole, so you don't have to worry about getting hit by golf balls! A very short walk to the beach with breath-taking views and very few people there. Kim, who manages the house, was on top of everything and even picked us up from the airport when our rental car company tried to hose us with extra fees. Sanchez is great. Keeps the house in terrific shape and is always on call, even when we couldn't get the hot tub to work at night (our fault...). We will definitely be back and soon! The house was beautiful! It was open and airy and very spacious. All of the rooms were nicely updated and very comfortable. Sanchez is very helpful and make our stay super easy. The backyard feels like an oasis. It has an amazing gazebo that is perfect for taking an afternoon nap – and the pool and hot tub are perfect. Everything on the resort is easily accessible via the provided golf cart. Also, Kim was very nice and accommodating – he got us lots of baby gear that made our trip much easier. We can’t wait to return! This was the first time we had rented a villa. We were a family of four, with 2 teenage boys. We all agreed it was better than being inside a resort. The privacy of the accommodations and pool were perfect. Since it’s set on a golf course, there are a few golfers driving through but they are fairly far away and the course is not very busy so you do not really notice them. We had Sanchez there daily and he continuously cared for the property and cleaned up after us. We recommend hiring the chef. Joanna services were perfect, the food was perfect, and chef martin’s meals were perfect. The food is very expensive there, even from the grocery store. We spent approx $400 daily, 2 meals with the chef, 1 meal at a local restaurant. That is what we would typically spend at a high end resort. Both Martin and Sanchez served the meals and cleaned up after. Taxis are fairly expensive, $25 from airport or grocery store. Dependent on whether you want to go outside the compound, you may want to price out a rental. For us, we used the golf cart and stayed local. The cart gives you access to Playa Blanca which has water sports, restaurants, and you have access to several golf courses, and a few restaurants. This house is a walk to the Tortuga resort . We almost stayed there and happy we chose this villa instead. We were a very short drive to the private beach (you can see it from the house) and if you want beach services, its another 3-5 minutes further down at La Cana Golf Club. You pay a $10 per person fee to access the ecological lagoon (fresh water swimming hole). You can access with cart and there are walking trails to reach them and are worth seeing. Kim, who manages the house is wonderful, easy going, and was a great help to us throughout the week. The house is in excellent condition and we were completely happy with the accommodations. Our family of 5 recently stayed at this home and absolutely loved it! The location was located right on a beautiful golf course and just steps from ocean. Beach was private and well maintained. The home was large enough for all to have their own space and gated community always felt safe and secure. Sanchez was wonderful in taking care of home and in making sure we had everything we needed. We hired a private chef service for 2 meals a day and the food was plentiful and outstanding. A very relaxing vacation with perfect January Punta Cana weather-we cannot wait to return! We thoroughly enjoyed our stay at Casa Blanca. It's a beautiful home with an amazing backyard (nicest gazebo ever), incredible views and, it's in a great location - a short walk to the beach and to the Tortuga Bay Hotel and a quick golf cart ride to the La Cana clubhouse. Kim, the property manager was a delight to work with and extremely helpful and Sanchez, the butler/ housekeeper and Alfonso, the cook we're also wonderful. Casa Blanca is loacted only 200yards from the nearest pristine beach and a 10minutes walk to the La Cana Club House. La Cana Club House offers a serviced beach and pool area, the "Grill" restaurant, Golf Pro-shop and the world known luxury "Six Sense Spa". 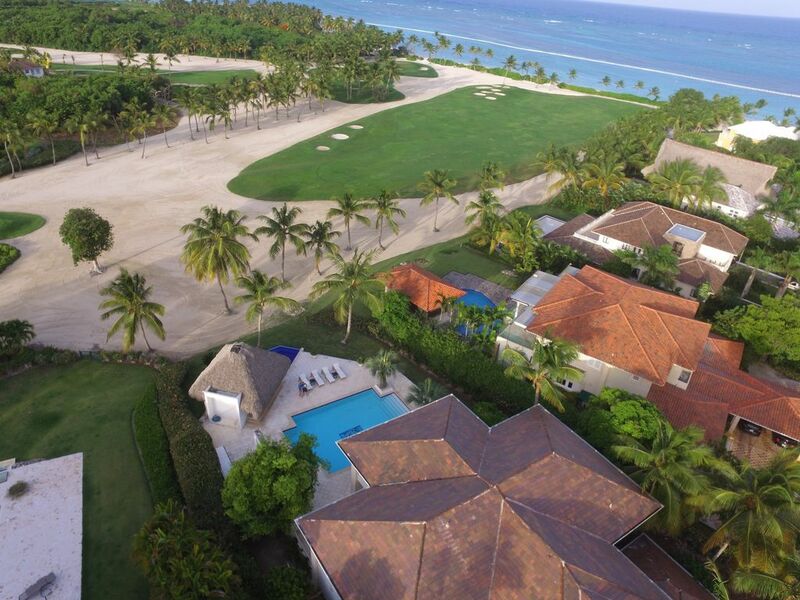 The resort offers 45 world class golf holes, La Cana Golf Course (18 holes by P.B. Dye), Hacienda Golf Course (9 holes by P.B. Dye) and Corales Golf Course (18 holes by Tom Fazio). The Villa is only a 5 minutes drive from Punta Cana Int. Airport. This beautiful villa is located in the exclusive gated community of Punta Cana, Dominican Republic, in the well known and established residential area name Tortuga Bay, a 26-square mile paradise that is blessed with a temperate year-round climate, light rainfall, and soft breezes. Its colorful coral reefs, calm crystalline waters and three miles of white-sand beaches are breathtaking. The Resort provides a matchless experience for all who visit this tropical paradise, and its tropically chic lifestyle is ideal for those who appreciate high standards of quality, comfort and aesthetics. As guests of the villa, you have access to all of the resort amenities and activities. Other Activities: Whale watching, petting zoo, horse ranch, tennis, three golf courses, water sports, scuba diving, snorkning, wind surfing, sail boats, deep sea fishing, segway excursions, etc..